Unearth a captivating and impressive Hotel when you visit one of the most amazing places on earth. 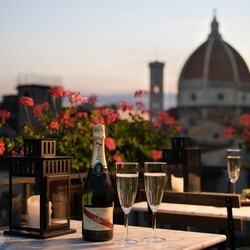 The unique and historic Borgo Pinti will surprise you with the exclusive & impressive Hotel Cardinal of Florence. The view is breathtaking from the panoramic terrace on the highest floor. Guests can choose from an array of splendid rooms each with its own appeal. A delectable range of breakfast foods and drinks whilst your eyes take in the entire city beneath your feet. The sun-soaked terrace is the perfect venue for breakfast. Here you will be served a delectable range of breakfast foods and drinks while your eyes take in the entire city as it wakes up. The Hotel Cardinal offers all our guests a wide variety of services and facilities. You certainly won’t be disappointed. Wifi is available in all rooms and throughout the hotel, including the terrace! Soak up the sun with a refreshing drink while you stay in touch with your loved ones. Is this a heavenly dream! No, it’s the Hotel Cardinal. Find yourself gripped by the calming and soothing shades of red that are resonant throughout the hotel, from the geraniums scattered amid the terraces and the bedrooms, to the striking drapes. This grand hotel casts a wondrous spell on you with its sun-soaked terraces against a backdrop of a myriad of impressive views. Including Santa Croce, Duomo & Baptistery to name but a few. Sip luscious and exotic flavoured cocktails in a delightful bar situated idyllically on the terrace of the hotel, complete with it own roof garden. Scented Jasmine and geraniums awaken your senses as you are surrounded in the soft glow of candlelight.